"No one move! I think I dropped my contact lens." The Pais Motorcycle Show was jam packed elbow ro elbow for 9 days straight. Here in America we just don't come close to the huge enthusiasm that Europe has for motorcycles. Similar consumer shows in England, Germany and Italy are just as packed with visitors. 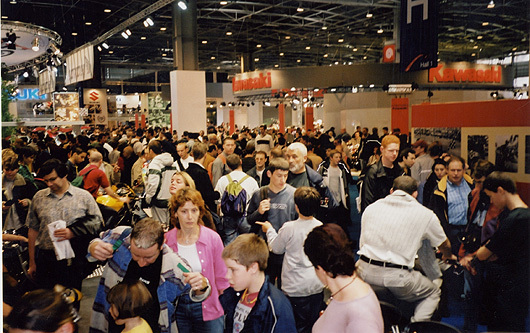 A week after the world's big annual Intermot Motorcycle Show, this year held in Milan, Italy, the manufacturers pack up their exhibits and head for Paris, where just a week later they set up again for the big 10 day Paris Show filling 3 huge event halls. The Paris Show continues to grow in prominence with 900 exhibitors in attendance and the Show drawing some 50,000 spectators per day -nearly 1/2 million in all! Some of the major manufacturers are now holding back at Intermot and using the Paris Show to premier new bikes. The most note worthy being Yamaha who had a huge exhibit with their crown jewell being the premier of their new YZR-M1 Grand Prix 4-stroke for next year's MotoGP World Championship. Parked next to it on a ground level tier was Max Biaggi's 500cc GP 2-stroke bike. But it was the YZR1000 which stole the show sporting all carbon fiber bodywork that changed from titanium silver to gold in color as it rotated in the lights on it's turntable. The Sachs 1000cc V-Twin Beast which premiered last year at the Intermot Show was on display again in Paris, Sachs hopes to have the bike in production soon. 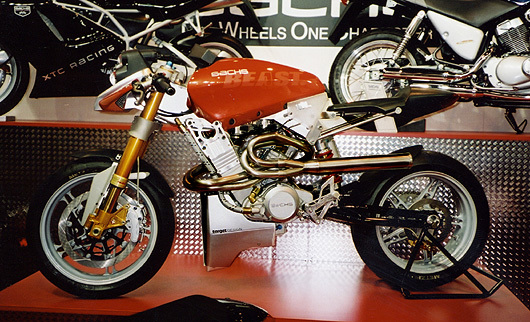 The minimalest design use the engine as the frame as well, simailr to the concept introduced by Britten some 10 years ago. 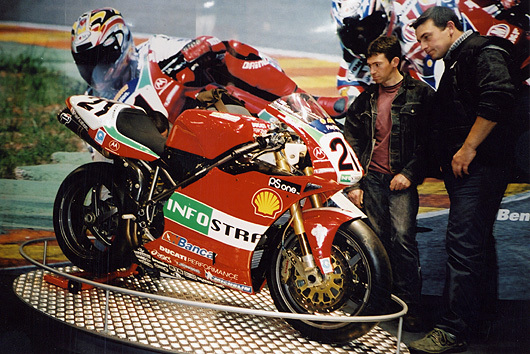 Ducati had one of the biggest and most popular manufacturer's displays at the Show and featured Troy Bayless' 2001 World Championship winning 996R Superbike on display, fresh from the previous week's final race. You can see more of Troy's winning Ducati right now together with our beautiful FastDates.com umbrella girls in Member's Corner. 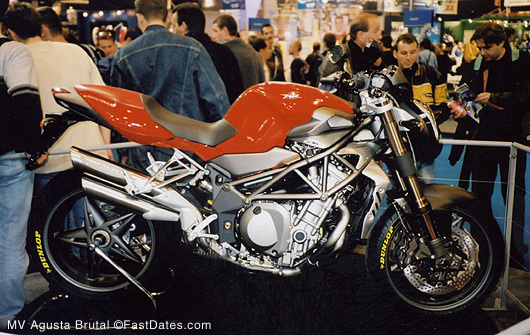 MX Agusta took their 750cc inline 4-cyclinder Superbike motor and put it in a trelis tube frame with a single sided swingarm, The result, the Brutal, their high end answer to Ducati's popular monster naked sportbike. Along with the Europeans, every Japanese manufacturer offered a full lineup of traditional naked style sportbikes. 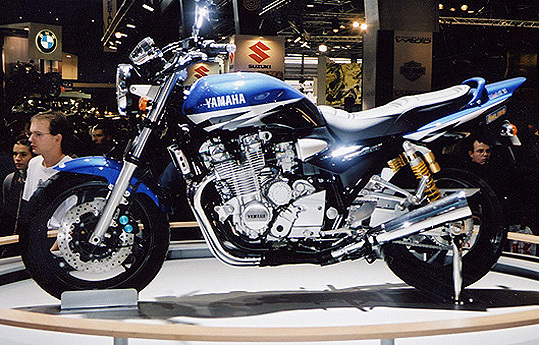 This XJ1200 aircooled model from Yamaha was one of our favorites. Note the stock Ohlins piggyback shocks and the massive front brakes. We want this in America! Our hotel during our stay in Paris was right here on the Seine River, just at the left side of this bridge, facing Notre Dame Cathedral at $115 per night. 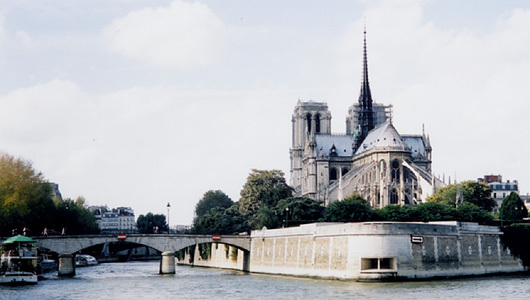 Round trip non-stop, Air France just $650! The ICE was a hot little scooter design with a sportbike style front end, alloy beam chassis and swingarm. It's just as cool to own a scooter in Europe as a trick sportbike. All the top manufacturers offer a full range from basic economy models right on up to full on sportbike spec models. Aftermarket companies offer a full range of tune up kits including pipes, pistons, cylinders and carb kits. Please buy a calendar below so we can go back to Paris again next year. Thanks!